Instead of cutting down new trees to make your desktop, we breathe new life into old wood. 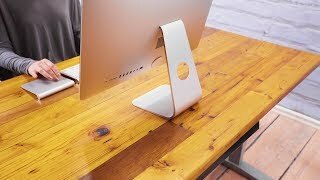 Our desktops use boards that were previously being used as flooring or the side of a barn. You'll get a wood desktop that is more economical and will ship out more quickly than a custom solid wood desktop. Where do you source the reclaimed wood? Our Douglas Fir comes from old mills, construction projects, barns or whiskey stills. The Teak originated in Indonesia and also comes from a variety of dismantled buildings. If only your desktop could talk, just imagine the stories it would tell. The Teak desktop has a smooth surface and is finished with a water/wax sealant. There is more texture on the Douglas Fir desktop, with natural divots and grooves. To help keep our costs low, our reclaimed wood desktops are only offered in standard sizes. Why is reclaimed wood so much cheaper than solid wood? We offer reclaimed wood desktops in standard sizes and house them in our warehouse, allowing us to pass along the savings to you. In comparison, our solid wood desktops are handcrafted when you place an order, and therefore are priced a little higher. What is that wood backing underneath my douglas fir desktop? That's the stabilizing and strengthening plywood backing! UPLIFT Desk douglas fir desktops now come with extra backing to ensure your desktop won't warp, bend, or break. Authentic reclaimed desks come from our artisans in California, who specialize in restoring hardwoods, granting a second life to very hardy materials. Each top is unique, and your finish may vary. Douglas fir tops come with a plywood backing to increase the desktop's strength. 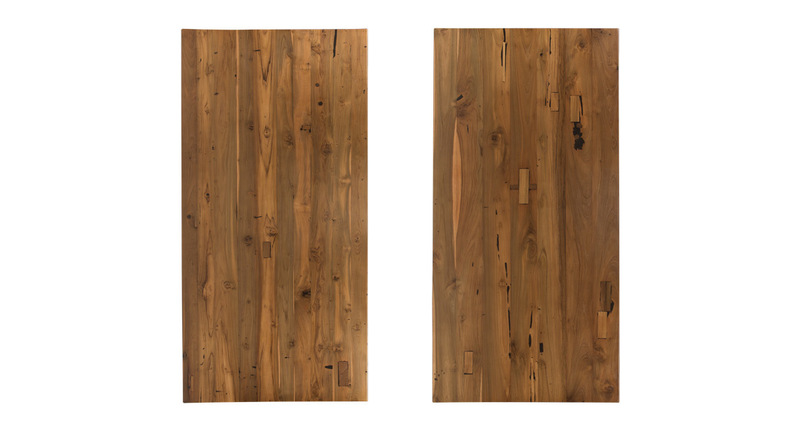 Reclaimed desktops are available in 30" depths and a variety of different widths: 42", 48", 60", and 72". Douglas Fir tops are also available in 36" and 80" widths, and 24" depths on 42", 48", 60" and 72" widths. Our wood desktops are some of the thickest available on the market. Douglas Fir desktops are 1.5" thick while Teak desktops are 1.25" thick.